This video has now been replaced by MTG410, however when you buy MTG410 you get MTG218 free. COMBINE HAND: This one combines many aspects of the first six methods and teaches us about instant attack and defense in any given situation. 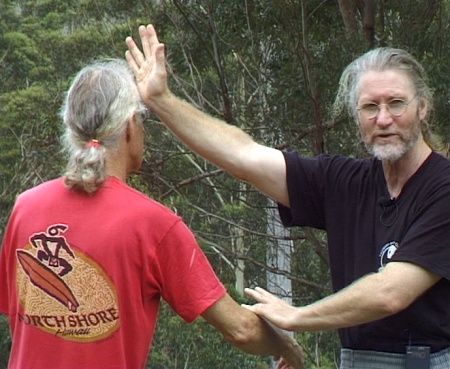 DART HAND: This method teaches us about the use of very quick hands in continually striking with different methods. One hand strikes as the other one controls etc., just like the Chinese weapon called the 'dart'. DRILLING HAND: This method teaches us about one of the most important methods of attack using drilling methods. SHOVEL or SPADE HAND: This one makes use of the flats of the palms for attack and defense as you would if you were using a shovel! DOUBLE BLADE HAND: This one uses the palms as if they were two blades in attack and defense. A very devastating method of self-defense also! STUMP PULLER HAND: This one has a lot of pushing (jerking) and pulling movements which work upon joints to dislocate them along with the more devastating dim-mak strikes.